Add comfort to your dining room with this transitionally styled 5pc dining set from CorLiving. This set includes four dining chairs with Desert Sand fabric seats and a counter height square dining table in a Rich Cappuccino stained finish with lower shelf and cabinet storage space. Constructed from hardwood and hardwood composite this easy to assemble dining set is a great value with exceptional style! This dining set includes four solid wood chairs and an extendable dining table with a built-in butterfly leaf that helps you create extra serving space in seconds. The leaf is designed to tuck beneath the table when not in use so you never have to find a space to store them. The solid wood chairs are designed with the contours of the body in mind, making them incredibly comfortable. Finished in a rich cappuccino stain, this dining set can upgrade the look of a room in seconds. Classic industrial style blends with a chic vintage look to compliment your contemporary dining space. This 3 piece bistro inspired set features a brown distressed-look, bronze metal tube legs, matching bar stools. Adjust the height of the table and stools to your desired preference with the unique twist mechanism. Ideal for smaller spaces, lofts, or eat in kitchens this table is must have for any urban household. 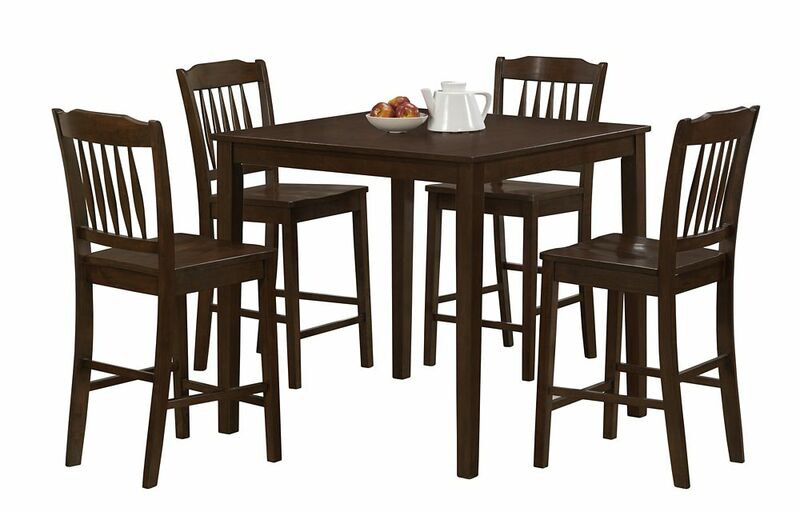 Cappuccino Veneer 5Pcs Counter Height Dining Set This transitional 5 piece dining set offers a mix of classic and modern styling that will blend with any dicor. _x000D_ Finished in a rich cappuccino, this counter height set features a square table top, tapered legs and four matching side chairs with vertical slat backs and scooped seating for added comfort. Ideal for smaller spaces, lofts and eat in kitchens, this set will help create a timeless look that you and your family will love.